GESS Mexico 2017 starts today, come and visit us! 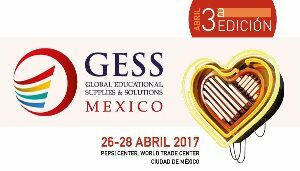 Today, 26th of April 2017, and for the next 3 days, will take place GESS Mexico 2017 (Global Educational Supplies and Solutions (GESS) México). This exhibition will be celebrated in Pepsi Center, World Trade Center in México City. As in other Worlddidac events, SMC International Training, member of this association, will be present in the exhibition. Please, visit our booth 338. We hope to see you there!